Our Exotic belly ring dazzles like a shooting star in a desert sky. The icy crystal jewel charm bursts with light and exquisite design. 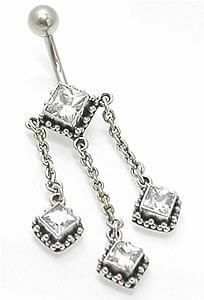 The tails of the triple dangles are blazing with large diamond-shaped crystal jewels and ignited with silver granulations. A one of a kind piece like this is hard to find! Looking for matching Exotic Sterliing Silver Earrings, look no further.